A sound education in business is just one component of being a good leader; to truly take your company to the next level, you must also possess certain qualities that come from within. Think about some of the business leaders you admire – maybe it’s someone famous who has changed the world with their product or service; maybe it’s your own father or mother, someone you’ve grown up with in close proximity and had years to study. Whoever it is, successful business leaders are born and made, and chances are good they all possess the following traits, either naturally or through practice and acquisition. Even better for you, if you’re ready to become the true head of your company and embrace progress, it’s never too late for you to develop them with some concentrated effort and dedication. Having the gumption to step into a leadership role (and stay there) takes courage right off the bat. But more than that, you must be brave enough to take chances, both on opportunities and people; you must be able to stand up to detractors from outside and within; and you need to be able to see past the minor bumps and have the wherewithal to pursue the future of your business despite the blockage of the present. Further, you have to be able to say and do the hard things, even though it might not make you popular, if it’s the right thing for the situation. Knowing where you want your business to go and having goals for the both the short-term and the long-term are very important. It’s a lot like writing a term paper. You start with an outline of the entire essay, knowing that you want to get from point A to point B and knowing the essence of the message that you wish to convey. As you get into the nuts and bolts of actually writing the piece, you will add, delete, revise and edit, and maybe even the entire thesis will change, but every small part, every little paragraph, works toward realizing the greater whole. Staying on course is easier when you have a clear vision of where you want to go, even if it changes along the way. People can tell when someone just doesn’t get them. More than that, they can tell when someone isn’t even trying to. And this makes them not want to work for them or do business with them. The show Undercover Boss on ABC helps illustrate, however unrealistic the situations actually are, that the people on top can sometimes lose touch with what’s important and real for the people they employ. Furthermore, in business dealings, you never know who you are going to meet, so keeping an open mind, educating yourself and trying to put yourself into the shoes of others will take you far. The fact is, being unable to adapt means you will miss out on a lot of opportunities and your business will only suffer for it. Globalization has ensured that information and data spreads faster than you can click a mouse. Don’t be afraid of change and don’t stubbornly resist new ways of doing things. Listen to the people around you, absorb what they bring to the table, and be willing to try. Strategic thinking is an important aspect to all management training programs; if you can embrace that with an open mind, you will be able to analyze possibilities with a clear, unbiased head. As the head of your company, you will shoulder a lot, and rightly so. You should also learn to shoulder the blame when it’s your fault. Human nature is such that we’re quick to point fingers and assign responsibility to others, but that’s a failing good leaders must overcome. Not to be confused with arrogance, you have to believe in every aspect of your business: you, your partners, your employees and your product or service. If you don’t…who will? None of these traits matter a whit if you don’t have the sincerity to back them up. Pretending and play-acting at understanding is obvious. Essentially lying to your employees about a job well done is both cowardly and a sure way to run your business into the ground. If you’re not feeling sincere, make the necessary changes and improvements until you are. William Lewis is a contributing writer and MBA graduate who has successfully created and sold two businesses thus far, and who is currently heading his third. His influences include Bill Gates and his older brother, Paul. 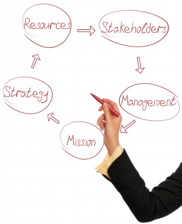 The Product Management Perspective: Product managers act as the CEO of their products. Leadership is key to succeeding in this role. The principles discussed here will help you focus your efforts in the right areas to improve the success of your products. Categories: Leadership, Learning | Tags: adaptability, confidence, courage, empathy, responsibility, sincerity, vision | Permalink.